Pulp and paper production has increased globally and will continue to increase in the near future. Approximately 155 millions tons of wood pulp is produced worldwide and about 260 millions is projected for 2010. To cope with the increasing demand, an increase in production and improved environmental performance is needed as the industry is under constant pressure to reduce environmental emissions to air and water. 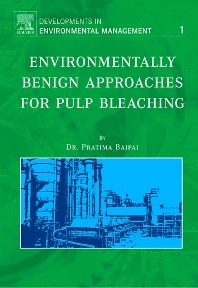 This book gives updated information on environmentally benign approaches for pulp bleaching, which can help solve the problems associated with conventional bleaching technologies. Options for environmentally benign bleaching. 3.1 Oxygen delignification. 3.2 Ozone bleaching. 3.3 Hydrogen peroxide bleaching. 3.4 Bleaching with chlorine dioxide. 3.5 Bleaching with peroxyacids. 3.6 Enzymatic prebleaching. 3.7 Fungal prebleaching. Chlorine free bleaching of secondary fibers. Closed cycle bleach plant. Abbreviations. Index.